An airman kneels in the Moore neighborhood south of Plaza Towers Elementary School. 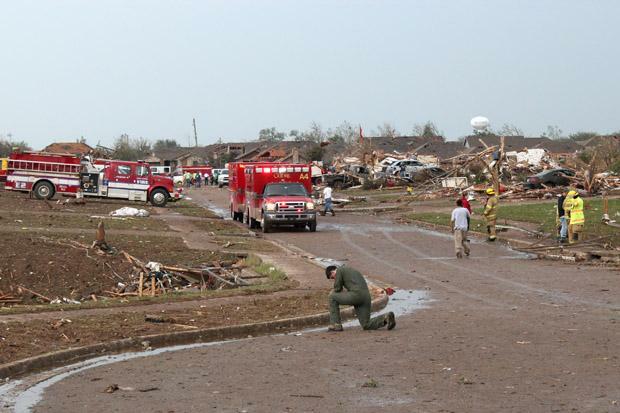 If you documented any part of the tornadoes that devastated parts of Oklahoma in May of 2013 through still photography, KGOU is asking you to share your photos for possible inclusion in an exhibit marking the one-year anniversary. KGOU's Ahead of the Storm: The Oklahoma Tornado Project is partnering with Oklahoma Contemporary Arts Center to present a curated photography exhibit dedicated to last May’s storms in Oklahoma. Photo submissions should represent the storms of May 2013, and may include the aftermath and recovery. Selected photos will be displayed in an exhibit at Leadership Square in downtown Oklahoma City during the month of May 2014. Submissions should be mailed to: Oklahoma Contemporary Arts Center, 3000 General Pershing Blvd, Oklahoma City, OK 73107. They may also be dropped off during regular business hours: Mon.-Sat., 9 a.m.-5 p.m. Deadline to submit photos is Friday, April 18 at 5 p.m. Photos should be no smaller than 8 ½ by 10 inches and no larger than 22 by 30 inches. Each photo submission should include a short caption for the photo (no longer than 20 words) which may include the location where the photo was taken. Submissions should also include contact information for the photographer (phone, address, email). Photographers will be contacted by e-mail or phone if their photo is selected for the exhibit. Selected photos will be matted and framed. After the exhibit's conclusion, photos may be picked up at Oklahoma Contemporary Arts Center through June 30, 2014. After that date the photos become the property of Oklahoma Contemporary Arts Center. Selected photos will be exhibited at Leadership Square in Oklahoma City during the month of May 2014, and honored at an opening reception on May 6, 2014. Selected photos may be used for promotional purposes or displayed in other settings or on digital platforms. For more information, contact Development Director Jolly Brown at 325-1601. During spring break, most college kids escape school and work for a simpler life at the beach. But sometimes, groups of teenagers and 20-somethings venture away from the sand and into the dirt. One Oklahoma group has decided to use those students to revitalize areas of Moore affected by the May 20 tornado. Spending your spring break planting trees in a muddy park thousands of miles from your home may not sound like the most relaxing and rewarding way to spend a week. 18-year-old Tyler Lawson from Connecticut realizes he’s working a lot harder than many of his classmates. With tornado season approaching, many Oklahomans will turn to social media sites like Facebook and Twitter to stay informed of the latest hazards. Use of these outlets explodes during severe weather outbreaks, as people try to disseminate information, share pictures and update each other on the course of the storm. But despite their ability to quickly deliver breaking news, social media can often contribute to spreading outdated information. While many view tax season as a nuisance, it can be especially frustrating for people struggling to rebound from disasters, like the deadly tornadoes that swept through the state last May. Some residents of central Oklahoma lost homes, cars and old tax documents, so they’re confused and unsure how to proceed, and that’s left many tornado alley taxpayers with lots of questions.